On May 16, the UFC will travel to the Philippines for the first time, and the fans in Manila couldn’t have a more appealing main event than the SuperFight between Urijah Faber and Frankie Edgar. With the fight just around the corner, we revisit the fights that made “The California Kid” who he is today. In January of 2007, the first WEC event under Zuffa ownership took place in Las Vegas, headlined by a lightweight title bout between Rob McCullough and Kit Cope. On the undercard was the promotion’s featherweight champion, Urijah Faber, who defeated Joe Pearson in defense of his crown. Two months later, Faber made the event poster as he took on a then-unknown unbeaten named Dominick Cruz. Faber made short work of Cruz, submitting him via guillotine choke in just 98 seconds. Little did anyone know that the two would meet again at bantamweight years later in the UFC and develop one of the greatest rivalries in the sport. And to this day, the only one to beat Cruz, the former WEC and UFC bantamweight champion, is Faber. By June of 2008, Faber’s grip on the featherweight division was ironclad, but after four successful defenses, fans wanted to see Faber in a SuperFight. In stepped former UFC lightweight champion Jens Pulver, and the biggest fight in WEC history took place in Sacramento on June 1, 2008. Thankfully, the action in the blue cage lived up to all expectations, with Faber eventually pounding out a five-round decision win in a fight that let the masses in the United States know once and for all that the lighter weight classes were here to stay. Five months after his greatest victory over Pulver, Faber was upset by Mike Brown and lost his title. A rematch with Brown and a WEC 48 bout with Jose Aldo also saw Faber come up short, prompting a move to the 135-pound bantamweight division. Faber won his first fight at bantamweight over Takeya Mizugaki, and then it was off to the UFC, where he split his first two bouts in the Octagon, defeating Eddie Wineland and losing to Cruz. That set up a UFC 139 bout against former WEC bantamweight champ Brian Bowles in November of 2011. At the time, many saw this as a pick ‘em scrap, considering that Bowles was coming off back-to-back UFC wins over Damacio Page and Takeya Mizugaki. But Faber made it look easy in San Jose, picking up Submission of the Night honors for his second-round guillotine choke finish. Faber’s win over Bowles earned him a second crack at Cruz’ title, but it was not to be, as “The Dominator” was put on the shelf with the first of a series of injuries. 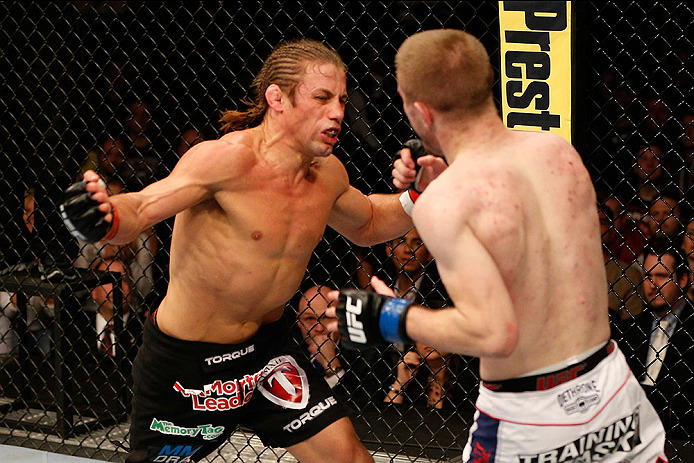 Faber instead was pitted against Brazil’s Renan Barao for the interim belt, a UFC 149 fight he lost. Undeterred, “The California Kid” put together a four-fight winning streak that included this April 13, 2013 win over good buddy Scott Jorgensen. And despite their friendship, Faber was able to put that aside for 18:16, the time it took for him to submit “Young Guns” by rear naked choke. Michael McDonald is seen by many as the future of the bantamweight division, but on December 14, 2013, Faber showed that he was still the present, delivering a master class that ended with a second round guillotine choke finish that gave Sacramento’s finest another post-fight performance bonus and kept his streak of never losing a non-title fight intact.